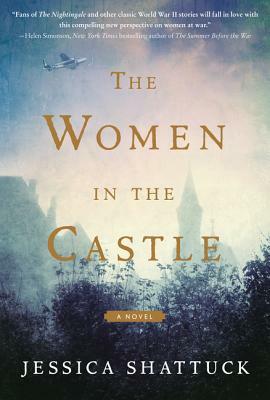 Set at the end of World War II, in a crumbling Bavarian castle that once played host to all of German high society, a powerful and propulsive story of three widows whose lives and fates become intertwined in an affecting, shocking, and ultimately redemptive novel. This book is quite remarkable in many ways. It is about post WWII Germany and depicts a number of fictional characters who were German citizens who hated the Nazis and Hitler. Most of this group were German aristocrats, and actually it was real German aritocrats who plotted an assination attempt on HItler in July of 1944. The real historical plot was a failure, and it was also a failure in this book, and a lot of the members of the German Resistance who participated in it were either hung as traitors or sent to concentration camps. So Ms. Shattuck has explored what could have happened to the wives and children left behind after the arrests of these resistors. In this book, three women and their children make their way back from bomb damaged Berlin to a decrepit Bavarian castle owned by one of the women's families. They attempt to make a life for themselves and their children in a Germany that is trying to recover from all the physical damage inflicted on their country at the end of the war. It is a Germany that will never be the same. This book is breathtaking in scope. The timeline for the book is from 1944 to 1991. The majority of the book is centered in Germany at the von Lingenfels castle where Marianne has assembled her small group of refugees. Marianne von Lingenfels' husband was involved in the July 1944 assination plot and he was hung by the Nazis. She and her three children, along with the wife of her best friend and their son are the first to arrive. Not long afterwards, another woman finds her way there with her two sons. These strong, remarkable women endure hardship and privation, but still manage to make lives for themselves and their children in the old castle. This is an important book because Shattuck's beautiful prose and the clear direction of her plot illuminate this not very well known timeframe and setting. The story of these brave women is one that should be read. It makes us fully understand the strength and determination of the human race and what can be accomplished with hard work and conviction.